This is a good working ipod classic 120gb and it can hold around 30,000 songs. Up for sale, a black iPod classic, 120 GB of storage. This item is in excellent working condition. The cover and case show average wear (see pictures). Adult own, working ipod classic 120gb. Was not used for over 3 years. Item is sold as is. I included plenty of pictures assuring condition. I'm not sure how much life the cover has left in it since I've already had to glue it back together before, but it's included as I have no further use for it. Feel free to toss it if you don't want it. Condition is Used. Has music in it’s sistem I think like 2000 songs of course Beatles! 120GB iPod 7th Generation, model MB565LL. The device connects to iTunes after several trying. There are scratches and signs of use. No other accessories will NOT include, such as headphone, the original box, and manual. Charging Cable. Apple iPod classic 5th Generation Black (120 GB). Condition is Used. Shipped with USPS First Class Package. iPod is in great shape. All original, not refurbished, was well maintained. Reset to factory settings. Ready for use. No box. No headphones. 3rd party adaptor included. Protective case with belt clip on it included (pictured). 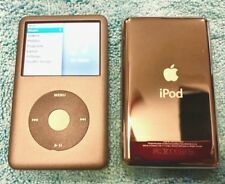 Comes with charger too iPod Classic A1238 7th Generation 120gb Grey/Silver works well! Scratches. Condition is Used. Shipped with USPS Priority Mail. Trending at $119.33eBay determines this price through a machine learned model of the product's sale prices within the last 90 days. 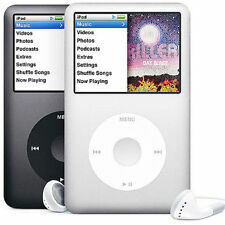 Apple iPod Classic 120GB 7th Generation Slim Version in Gray color. 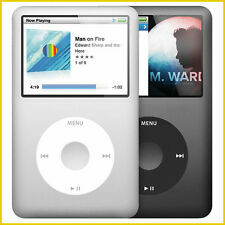 The iPod has been professionally refurbished by us to look and operate as new ! - Updating the iPod to the latest software (ver 2.0.4) and restoring to factory default. For sale is my ipod classic 120gb. The unit is in good condition, although it does have a few scuffs on the front, they do not affect the usability of the ipod or it's function in any way. The iPod is in good condition and works perfectly. Back case shows moderate scratches, normal wears. For sale I have the Apple iPod 5th Generation Black with 120GB pictured here. Ipod classic 7th generation 120gb loaded with 16,646 of Rock and Pop music, battery life is good and everything works as should. Apple IPOD CLASSIC - 7th Gen / 7G - 120GB - Grey - Works Great! Bundled w/ case! Bundled with a protective case! Used, many minor scratches but works great! Case included! We will make the situation right, or help you to the best of our ability. In a nutshell: We love what we do and it shows! Tested for Key Functions, R2/Ready for Resale. Step 4 - We do a final diagnostic test on the computer to verify that it is ready to be sold. The iPod is in good condition and works perfectly. Back case shows heavy scratches, normal wears. IPod has been outfitted with a 128GB Micro-SD card using Tarkan's iFlash Solo Board of iflash.xyz. - 1.7x better battery life than an SSD mod. The SD card mod allows for Upgrades made to the iPod.